The Identity of Game of Thrones’ Matt Damon Guy – Revealed! According to George R. R. Martin’s blog, he’s a recent grad of RADA (so maybe the photo’s just really old?) who came in to read for a few different roles and was impressive in all, so when they had to recast this role (the character name is Ser Waymar Royce, and apparently the original actor was Jamie Campbell Bower, who couldn’t come back to be re-decapitated by snowy woodland Imhoteps because he had to go star in the series ‘Camelot) they thought of him. This series has been extremely well cast, imho, so who knows, maybe we’ll be seeing much more of him. Like perhaps a charming movie about a young tough math genius, or an adventure series about casino heists. But alas, we do know we won’t be seeing more of him on ‘Game of Thrones’. Unless, of course, he can find another way to, ahem, get ahead, if you get what I’m sayin’. Thanks! I thought maybe Matt Damon had a brother or cousin or something! You’re very welcome! And Welcome to the blog! And I wondered that too – it really is a crazy resemblance. At least if Hollywood ever needs someone to play the younger version/brother/cousin of Matt Damon, they know who to call! Thanks, I just watched it and couldn’t believe it. Uncanny. Figured I was never going to find out who it was simply cause he was only in the first few minutes. But he did a good job. Nice work. 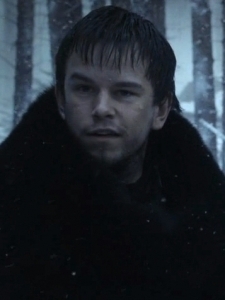 I was struck by how much he looked like Matt Damon in that short segment if GOT, episode 1 when I first saw it, & even moreso when rewatching in anticipation of Season 2. Thank you!! That does solve a mystery – I was wondering why Jamie Campbell Bower would be playing such a small part originally, but if the character has a potential spooky future it makes sense. I’ll keep an eye out! And, I’ll secretly hope that if there are more of them, they cast someone who looks like Ben Affleck. Took me a long time to accept that I was seeing things. Right?! If that guy decides not to have his own career, he would have a great career as a stand-in for various people in Hollywood! Wow I never saw Matt D. but it is true I suppose this young man drove me to search out his name. In that short apperance in G. of Thrones I was amazed he is a TERRFIC actor. who knows others have come back when killed on the OTHER side of the wall.